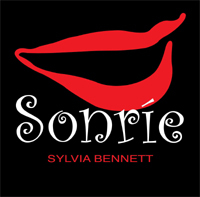 Italian born Sylvia Bennett equally known for her stint with Lionel Hampton as his protégé vocalist, a Grammy Nomination and a catalog of her own recordings raises the stakes once again with her latest endeavor Sonríe. Motivated by her passion for Latin music and culture, Sonríe realizes one of Sylvia Bennett’s most cherished dreams: a Spanish-language delivery of timeless classics. What inspired me was Bennett’s impeccable delivery of the Spanish language; her ability to articulate the accents in the right spots and to not homogenize the entire offering, this premise is the cornerstone to this entire release. Bennett no question has a warm inviting tone that instantly captures you. Though foreign languages are not new to Bennett (sings in French, Spanish and English) it is the authenticity of her delivery in Sonrie that takes this recording to an entirely different level. Joined again by producer Hal Batt, the two have concocted a wonderfully conceived mix of ballads and love songs, which accentuate Bennett’s smooth delivery. Enhanced with nylon sounds from the Vienna Strings’ these lush arrangements remind me of Diana Krall’s The Look of Love, but offered in a Latin setting with a bit more spice. Consuelo Velasquez Torres Ortiz’s internationally recognized “Bésame Mucho” is passionate and poignant, aptly conveyed by pianist Mike Levine and guitarist/producer Hal S. Batt. Bennett is offered a palate of colors and textures to build upon and steps up to the task with a breezy delivery that transports the listener to beaches and cool drinks. Bennett and her traverse through some of the most well-known landscapes of jazz and Latin classics, but each one is given its own unique sound and deliveries making this a definitive listen for Latin Jazz lovers. Renditions of “Perfidia” and Alvaro Carrillo’s immortal “Sabor a Mi,” are gleaming examples, Bennett sings with as much refinement and savor in Spanish as we all have grown to expect from her in English, how could not Sonrie .